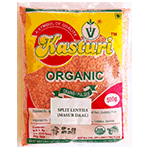 The most common type of red lentil. Colors can actually range from gold to orange to actual red, these are the sweetest and nuttiest of the lentils. In the main, it's a lovely salmon pink in its dried form, but it turns golden when cooked. These lentils cook faster than others and are usually done in about 30 minutes. They're best in purées or soups. Masoor dal is probably the most commonly used Daal in India. It is basically the split lentil without skin and is red in color. It does not need soaking prior to cooking as it is a "soft" Daal and cooks quickly. With 26% protein, lentils have the third-highest level of protein, by weight, of any plant-based food after soybeans and hemp. Masoor dal is an important part of the diet in many parts of the world, especially in the Indian subcontinent which has large vegetarian population. The seeds have a short cooking time (especially for small varieties with the husk removed, such as the common red lentil) and a distinctive earthy flavor. Dal (also spelled dahl or daal). Product of India.